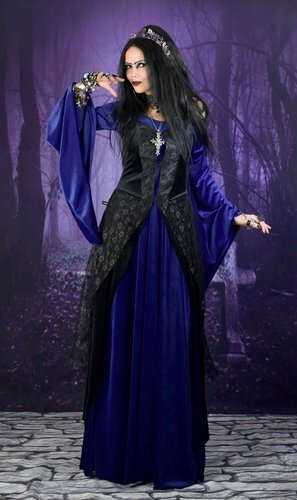 This is our gorgeous Steamberry dress, another Moonmaiden Gothic Clothing exclusive! Simple and so effective, an off-shoulder neckline, with an empire-line cut, from whence the skirt falls like a willo-the-wisp to the floor! Shown in our Midnight Steamed velvet, it's available in all shades, and is worn here in some pics with our Esteriel Duster Coat!